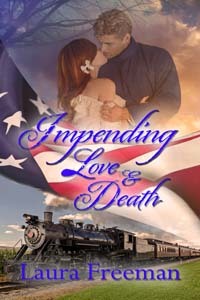 When Jessica Beecher stops to help a wounded soldier on the Gettysburg battlefield, Confederate Major Morgan Mackinnon enlists her skills to nurse his sister. Unable to escape, she waits for Union forces to attack the retreating Confederate Army. But the delay forces Jess to look beyond the gray uniform to the man who has captured her heart. Morgan can’t let Jess leave when she overhears Lee’s army is retreating during the night. She’s a dangerous woman and not because of the knife she pressed against his throat or the revolver hidden beneath her skirt. The battlefield angel has a face no man can forget, especially when facing death. The scruffy-looking passenger turns out to be more trouble than Colleen “Cole” Beecher bargained for, especially when Blake becomes her patient. After a suitor spurns her to marry a rich socialite, she travels to Washington City and throws herself into work to help the Union cause. When Blake offers her a job at his hotel, she takes it for the money, but her heart desires more. When hotel owner Blake Ellsworth boards a canal boat to escape the Cassell brothers, he meets a headstrong beauty who saves his life when he is shot. 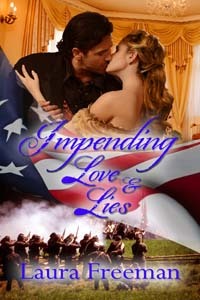 Despite his attraction to her, Blake is determined to join the Union army once his shoulder heals. Fearing he may make Cole a widow, Blake won’t propose marriage, but eight weeks is a long time to spend with a woman who stirs more than his imagination. Politician Logan Pierce visits Darrow Falls, Ohio, to enlist support for the Union cause. There, he meets the beautiful and strong-willed Jem Collins and insists she remain at home for news of her husband, Ben, after the Battle of Bull Run, but she ignores his advice. Jem knows something is wrong when Ben doesn’t send word he has survived the first major battle of the Civil War. Jem travels to Washington City with Logan to search for news of Ben and uses her nursing skills to care for the wounded. When Logan kisses her, she resolves to remain faithful to her vows of marriage, but can she? Fearing Ben is a prisoner, she leaves the federal capital for Richmond but doesn’t return. Can Logan wait, fearing for her fate, or does he risk capture and hanging as a spy by following into enemy territory? Cory Beecher didn’t mean to shoot handsome Tyler Montgomery and only kisses him so he doesn’t find the runaway slave in the barn. Abolitionists never considered marrying slave owners, but her world explodes with new found desire when her lips touch his. Can she go through with her carefully crafted plans to marry math instructor Douglas Raymond when her heart longs for another? Tyler Montgomery needs to find the runaway slaves before his rival Edward Vandal captures them. Although he doesn’t want to involve the fiery and beautiful Miss Beecher, once she kisses him, all his plans unravel. As his rival closes in on the quarry, he hesitates to leave, knowing she’s marrying the wrong man. But what does an unemployed lawyer with questionable parentage have to offer the woman he loves?